To use the cloud-based service, a subscriber drops audio or video files onto the site. From there, according to the company, the conversion into text form takes less time than the recording itself, depending on the speed of the internet connection. Currently, Trint accepts these audio formats: .MP3, .MP4, .M4A, .AAC and .WAV. Acceptable video formats are: .MP4, .WMA, .MOV and .AVI. Pricing is based on a pay-as-you-go structure ($15 per hour, charged by the minute) or a monthly structure that offers a discount and allows the user to roll over minutes from month to month. The company also offers "corporate" pricing, for teams of users. In that scenario, a $250/month account will cover 25 hours of uploaded recordings; every minute after that is $0.17. 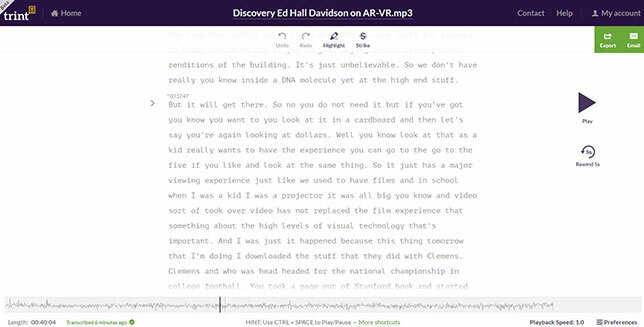 Trint allows the user to review and correct the machine-generated transcripts and then export the results to a learning management system for sharing with students. Recordings include instant timing of selected quotes. Institutional clients have included users at Northeastern University and Michigan State U, among others.